The BOXER is an 8x8 all terrain heavily-armoured utility vehicle that is produced in nine different vehicle variants. The BOXER Programme provides the German and The Netherlands Armies with a new generation of all terrain armoured utility vehicles. BOXER includes balanced capabilities of transport-capacity, mobility, protection, survivability, growth potential and efficient life cycle costs. BOXER can operate in high intensity conflicts, in rapid reaction peace support and in humanitarian operations worldwide, offering improved capabilities and higher levels of performance and protection than other vehicles on the market. In December 2006, OCCAR placed the contract for series production of 272 vehicles for Germany and 200 vehicles for The Netherlands with ARTEC GmbH - a consortium formed by Krauss Maffei Wegmann (GE), Rheinmetall Landsysteme (GE) and Rheinmetall Nederland (NL), the former Stork PWV. 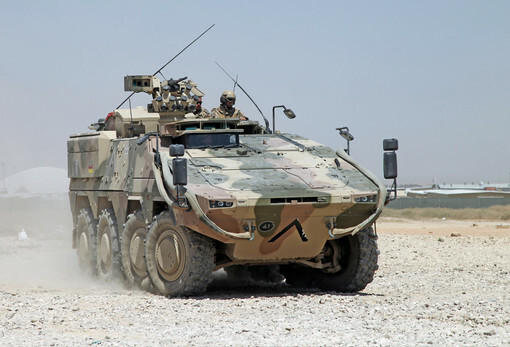 The BOXER is delivered to Germany in four different vehicle versions, and is delivered to The Netherlands in five different vehicle versions. The concept of a drive module and an exchangeable mission module makes it a flexible military vehicle, thus ensuring a maximum strategic and tactical deployability in a wide range of operational scenarios. The unique modular concept of the BOXER offers major opportunities for developing new vehicle variants. The vehicle prototypes were undergoing an extensive qualification programme. The first series production vehicle was delivered to Germany in September 2009. Germany started operating BOXER in Afghanistan in August 2011, very much to their satisfaction. The first Netherlands BOXER was delivered in August 2013. A contract for delivery of a second batch of 131 BOXER to Germany was awarded in December 2015. Lithuania joined the BOXER Programme in August 2016 to procure 89 BOXER in an Infantry Fighting Vehicle version. Lithuania joined the BOXER Programme in August 2016 to procure 89 BOXER in different Infantry Fighting Vehicle versions and 2 Driver Training Vehicles. In February 2018 the Slovenian MoD decided to join the OCCAR family by becoming the fourth Participating State in the BOXER Programme, with the idea to procure 48 Infantry Fighting Vehicles (IFV) in different versions. However the Slovenian MoD suspended in March 2019 the integration process until further notice due to internal constraints . In April UK announced its intention to re-join the BOXER Programme to procure a fleet of new armoured vehicles that fulfils the requirements of the Mechanised Infantry Vehicle (MIV) Programme. 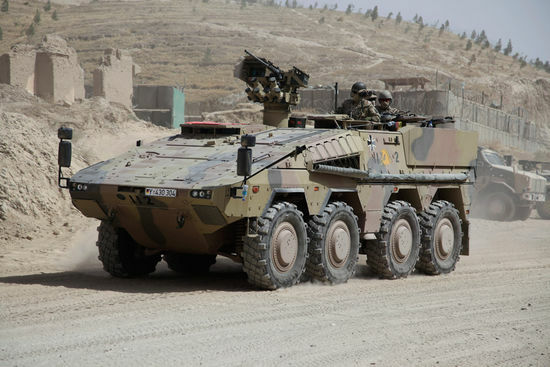 The Commonwealth of Australia is also a BOXER user nation as they decided in March 2018 to procure 211 BOXER vehicles directly from the German Company Rheinmetall. Basic vehicle consisting of a common (8x8) drive module and an exchangeable mission module (in less than 1 hour). Mission modules are equipped according to national specific requirements for the vehicle version. Delivery of the 500th BOXER vehicle. On 7th February 2019 another major milestone in the BOXER Programme took place: the delivery of the 500th BOXER vehicle. The vehicle was handed over by the manufacturer KMW at its facilities in Munich and it is a GTFzA2 variant (Gruppentransportfahrzeug). The UK will re-join the BOXER Programme with the intention to equip the Army with the 8x8 BOXER vehicles to modernise its vehicle's fleet and to fulfil the requirements of the Mechanised Infantry Vehicle (MIV) Programme. In February the Slovenian MoD announced on its homepage that they had chosen BOXER as the base vehicle to form two new mechanised infantry battlegroups. Slovenia joining OCCAR by becoming the fourth Participating State in the BOXER Programme will eventually be a reality soon. A Service Level Agreement on “Provision of Ammunition and Missiles” between NSPA and OCCAR-EA, on behalf of the Ministry of National Defence of Lithuania, was signed in a ceremony at NSPA in Luxemburg on Monday 18 December 2017. On 15. December 2017 two BOXER Driver Training Vehicles (DTV) have been handed over to the Lithuanian Armed Forces. This is the first big milestone for Lithuania after the contract was signed end of August 2016. For further information about the BOXER Programme, please contact the Programme Division or the Prime Contractor.